Magnentius (Latin: Flavius Magnus Magnentius Augustus; r. 303 – August 11, 353) was a usurper of the Roman Empire from 350 to 353. Born in Samarobriva (Amiens), Gaul, Magnentius was the commander of the Herculians and Jovians, the Imperial guard units. When the army grew dissatisfied with the behavior of Roman Emperor Constans, it elevated Magnentius at Autun on January 18, 350. Constans was abandoned by all except a handful of retainers, and he was slain shortly afterwards by a troop of light cavalry near the Pyrenees. 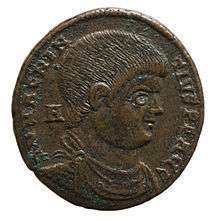 Magnentius quickly attracted the loyalty of the provinces in Britannia, Gaul, and Hispania, in part because he proved to be far more tolerant towards both Christians and Pagans. His control on Italia and Africa was applied through the election of his men to the most important offices. However, the short-lived revolt of Nepotianus, a member of the Constantinian dynasty, showed Magnentius that his status as emperor was to be consolidated against the members of that dynasty. Magnentius tried to strengthen his grasp on the territories previously controlled by Constans, moving towards the Danube. Vetranio, commander of the Pannonian army, had been elected Augustus by his troops in Mursa on 1 March. This revolt had a loyalist mark, since Vetranio was supported by Constantina, and Constantius II himself recognized Vetranio, sending him the imperial diadem. The remaining emperor of the family of Constantine I, Constantius II broke off his war in Syria with Persia, and marched west. Despite Magnentius' efforts to gain Vetranio to his cause, the elderly Vetranio reached Constantius with his army, resigned the crown, and went into retirement in Bithynia. After electing Magnus Decentius (probably his brother) as Caesar and gathering as many troops as possible, Magnentius advanced his armies to meet those of Constantius in the Battle of Mursa Major in 351; Magnentius led his troops into battle, while Constantius spent the day of battle praying in a nearby church. Despite Magnentius' heroism, his troops were defeated and forced to retreat back to Gaul. As a result of Magnentius' defeat, Italy ejected his garrisons and rejoined the loyalist cause. Magnentius made a final stand in 353 in the Battle of Mons Seleucus, after which he committed suicide by falling on his sword. Following the suppression of Magnentius' rebellion, Constantius commanded an investigation be made to find his followers. The most notorious agent in this search was the primicerius notariorum Paulus Catena ("Paul the Chain"). Some sources state that Magnentius' father was a Briton and his mother a Frank. His wife, Justina, later remarried to Valentinian I. ↑ Drinkwater pp.131–59. Original sources: Epit. de Caes. 42.7; Zos. HN 2.46.3, 54.1; Zonar. 13.6.1. Cameron, Averil, and Peter Garnsey ed., The Cambridge Ancient History, Vol XIII, Cambridge University Press, 1988. Drinkwater, J.F. (2000). "The revolt and ethnic origin of the usurper Magnentius (350–53), and the rebellion of Vetranio (350)". Chiron (30).